One of the more exciting changes I’ve seen happen since I first started homeschooling has been the growth in online learning opportunities. The existence of online courses for high school or dual enrollment has been around for awhile, but in the last few years, the number of opportunities for K-8 students has really blossomed. As little as five years ago, you’d be harder pressed to find online classes or dynamic video courses geared specifically to elementary school students. Now, these sorts of opportunities are abundant. When my own kids were younger, I felt like I had a handle on what was out there for their age. Since then, websites that started out with content like algebra or American history geared toward high school students have been expanding their offerings to include more and more content for younger audiences. There’s so much out there that it’s impossible to catalog it all. There are a lot of different options out there for online learning for younger students now. Most people are aware that there are whole curricula online and online schools. More excitingly, there are now a lot more individual classes being offered for younger students. Some of these are from small companies with a few teachers. Others are on clearinghouse sites, where lots of different teachers and companies can offer classes. On a small company site, the quality of the classes won’t vary much. On a clearinghouse site, prices and quality can vary immensely. Some classes happen live, at a particular time, and your student has to go online and participate. Others involve videos or readings followed by assignments that are graded or given feedback by the teacher. There are a lot of free or inexpensive video based courses or lectures now as well. Some of these require that you enroll in a “class” to access them. This includes a lot of Massive Open Online Courses (MOOC’s), which used to be solely geared toward college material but have more and more for middle and high school that might appeal to motivated younger students. There are also a growing number of interactive websites for things like math, vocabulary, and spelling, where students can get immediate feedback and you can track their performance. At one time these sites were geared toward test prep for older students, but now they teach elementary level skills. Some of them have “game” elements, where students can get badges and customize their learning avatar. Speaking of games, there are also an increasing number of academic classes that use Minecraft to teach everything from history to coding. Essentially, there’s a lot out there. Some of it is free, some of it is expensive. Some of it is highly interactive, some of it is passive. Some of it involves real people that you talk to in real time, while some of it does not. Obviously, keep internet safety rules in mind. I don’t like to encourage anyone to worry too much about the internet and their kids, but it’s always good to have a reminder to talk to your kids about internet safety. Even with things like online classes and educational videos, when kids are this young, it’s good to keep the screens mostly accessed in places where you can see what’s going on. More than keeping them safe, it’ll help keep them on task. The best practice, especially for the youngest learners and interactive content or videos, is to do it alongside them. Don’t hold your student back or push too far ahead. It can be tricky to know what the right level is for some of the resources that are out there. On the one hand, watching a series of college level lectures may sound like way too much for your nine year-old. On the other, hand, you may be hearing about other parents using such resources with their elementary school kids. Don’t be afraid to try things out, especially when they’re free resources. I heard from lots of parents that a particular MOOC about paleontology was perfect for younger students, so I enrolled with my kids and it was a great experience. On the other hand, when we tried some other higher level resources at the same age, my kids quickly lost interest. You know your kids best. If they get a glazed look on their faces when you tune into a class that is above their level, maybe it’s best to save it for the future, even if you hear that other kids are doing so well. But if your student lights up, even if you think the material is beyond them, let them give it a try, especially for free or inexpensive resources. Read reviews and ask around for recommendations. Word of mouth is still the best way to find out what’s worth your time in the homeschool world. If you’re about to put down money on a class, ask around and see what everyone likes. Particularly beware scams and fly by night outfits. There have been a few providers of online homeschool classes that have gone out of business in the last few years and even been involved in fraud. Reading reviews can help you spot the bad eggs. It’s okay to take a risk on a lesser known teacher. On the other hand, one of the nice things about the internet is that now individual teachers can access platforms to teach online. There are lots of individual teachers offering online courses now who may not have the most reviews or the most sleek websites. I’ve especially noticed that there are more teachers who used to teach homeschool classes out of their homes or small co-ops who are now moving to teach some of their offerings online. There are some great bargains, but you often get what you pay for. There are some amazing free resources out there now, typically supported by grants. However, if you’re going to enroll in a paid class, you often still get what you pay for. Semester-long courses that are only $20 are probably not going to live up to their hype. Even for younger students, if you want detailed feedback for your student’s writing and attention to their work, then you’ll need to spend more. If you have a gifted child, consider a talent search. One of the longest standing sources for online classes for younger students has been university based talent searches. These require that students show testing to prove they’re advanced enough for the courses offered. In a marketplace that now has more offerings, these aren’t the only option anymore, but they can still be a good way to access some really good, challenging classes, taught by excellent instructors. Remember that time offline is still key at this age. Finally, students this age are still kids. They still need tons of quality face to face interaction. Younger students still get a huge benefit from actually touching their materials. Students are still developing small motor skills through tasks like handwriting well into elementary and even middle school. Being outside, away from screens, is extra important at this age, with benefits for young, growing bodies in a myriad of ways, such as developing core strength and good eyesight. 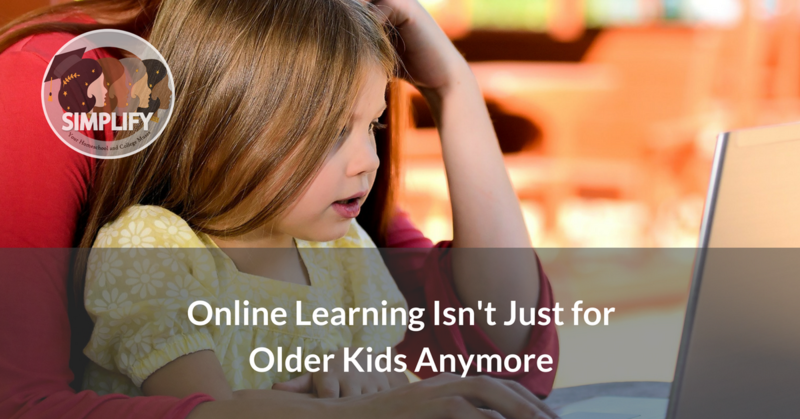 Basically, online learning is a wonderful thing, but be sure that it’s not the only way that your student is learning at this age. Even if you choose online programs as the backbone of your academics, there is no way to just plug in an elementary student, even an older one, and let the computer do the work.